You want to ruin your students’ day? Tell them they have a group project as part of your class. 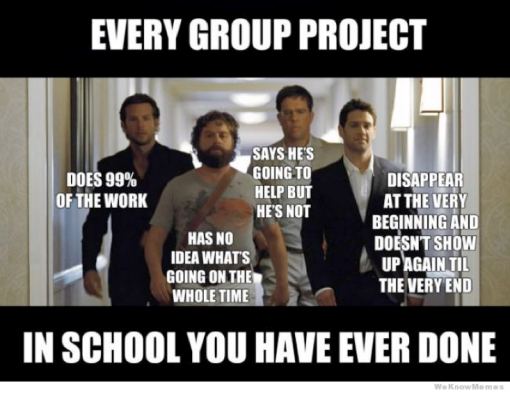 Yes, the dreaded group project. Where a student puts their grade in the hands of others. You know the joke… When I die, I want my group members to be my pallbearers, so they can let me down one more time. The perceived problem with group projects is that students have to work together outside of class. That’s not necessarily a problem, to be honest, but it can be inconvenient when students have schedules that don’t match up, some live in residence halls on campus while others live in apartments far away from campus, some have club responsibilities, and so on. Students’ schedules don’t always work the way we want them to. So what can be done? Technology can help, but what kind of tools do you need? How do you get students to have meetings together? This is where it can get difficult. Some students might want to use FaceTime, but that automatically excludes those with Android phones or PC’s. Google Hangouts? OK, there’s an app on iOS for Hangouts, and that could be an option for now, but some reports have Google stripping Hangouts from consumers by 2020 . So that’s OK for now, but down the road it might not be an option. Of course, there’s other tools out there like GroupMe that do allow for collaboration and communication, but it’s not a tool that is likely going to be sponsored by the institution. So what about the LMS, does it have a tool? Where I teach, we use Blackboard Learn, and while there’s group tools…they stink. What would be ideal is a group tool that is provided by the institution that the instructor can set up for the teams in their class, and that the instructor can also actively participate in if necessary. This tools should allow voice, video, and text chat along with posting of links to documents (and maybe the occasional animated .gif for a little bit of a humor break). The tool, though, must be accessible – which could limit options. If we want students to work together in groups, we have to provide them with the needed tools to accomplish their tasks. Not doing so opens the doors for anything that is convenient to the students to be picked, and those tools may not allow for full accessibility by all students, and it may take away some oversight by the instructor.